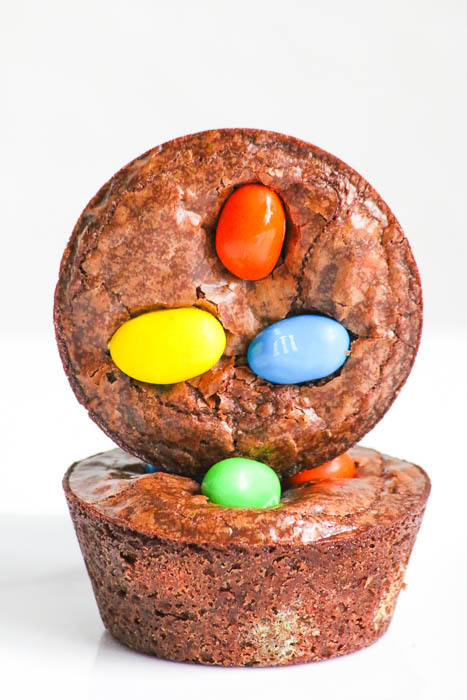 I made Gooey Peanut M&M Brownie Cups weeks ago. I posted pictures on Instagram, Twitter and Facebook to tease everyone and was thrilled with the feedback from those who tried them. Fast forward and I saw my friend Barb’s mother Joan at Samuel’s school this past Friday. Joan and her foodie friends get together for decadent dinner parties. One is coming up soon and Joan said she had a few Gooey Peanut M&M Brownie Cups in her freezer but wanted to make more. I told her that the recipe was on the blog but was shocked when Joan said she did not think this was the case. There was a good reason why: I searched and searched and searched and only to realize that I had done so many social shares teasing this recipe that I, actually, thought I had posted it! Talk about an O-M-G moment! I don’t know what I was thinking but I am very thankful that I ran into Joan. This recipe is ridiculously easy to make and the taste is outrageous. 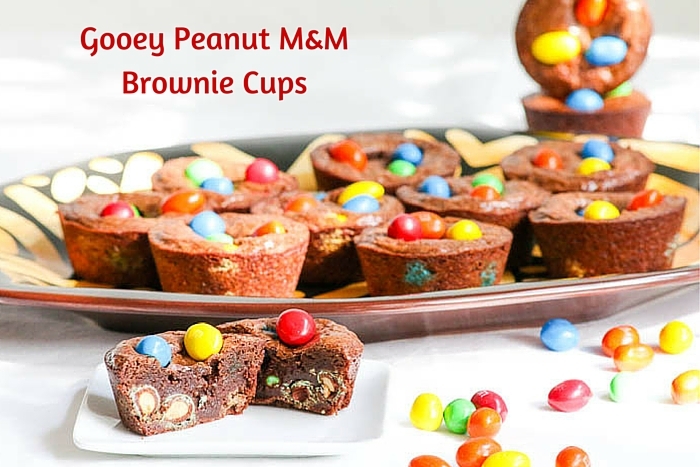 The only thing left to do is SHARE it with you so you in turn can then share Gooey Peanut M&M Brownie Cups with others. Lastly, use a wooden spoon to mix in the chocolate chips. Most will melt, but you may have some that still hold their shape. Stir in 1 cup peanut M&M's. 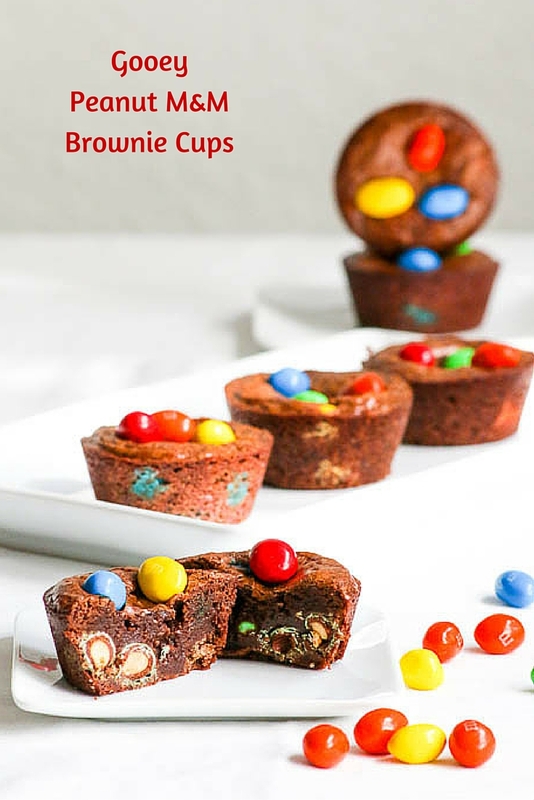 Remove from the oven and immediately place three peanut M&M's onto each brownie cup, gently pushing them partway into the tops. Cool completely in the pan. 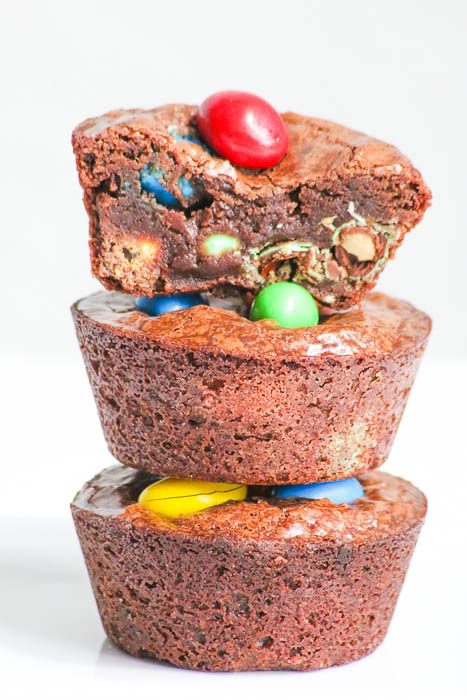 Use a small metal spatula to go around the edges of the Gooey Peanut M&M Brownie Cups. Remove from the pan and serve. OMG – these are heavenly treats!! Thanks so much for your lovely words!!! They are MIGHTY delish!! They look delicious! Such ooey gooey chocolate! Thanks so much. There is something so enticing aobut ooey gooey chocolate! I’m glad you ran into Joan, too. These look amazing! Cracking up, Jessica! I really was blown away when I realized that I had not posted this recipe. I need my braincells back! These definitely are eye candy! 😉 I have NEVER found a brownie I could refuse, and these with extra chocolate chips and what my youngest daughter calls “peanuts in the shell” are getting pinned right now! I’m pretty sure we’ll be making them soon. This makes me so happy. I loved baking with peanut M&M’s….especially when I realized that I could not stop eating them out of the bag! What lovely and cheerful cupcakes these are! Oooo…one of my favorite candies is this recipe. Love M&M peanuts. Super yummy! Thanks so much. Peanut M&M’s are one of my favorites, too. Yum, I love chocolate and peanuts together, these look fantastic! Thanks so much, Joy. There is something pretty magical about combining chocolate and peanuts!